Glide slope is a term used to describe the path of flight that ensures a safe and successful landing for an airplane. It can also be used to describe a path of success for your energy and sustainability efforts at your medical facilities. Making a successful landing with your energy and sustainability along your glide path will increase available dollars for patient care, comfort, satisfaction and ultimately your bottom line. Most managers set goals to reduce consumption by a certain percentage as compared to past years or it might be to reduce overall dollars spent on energy. But does meeting those metrics tell you if you are more effective in using energy? Can you easily and in context compare your performance to past years performance, other facilities in your network, region or industry standards? If these questions are important to your management style and a long term view is a priority, you need an Energy Glide Slope (EGS) to show you the path to a safe landing. Frequently, facility manager’s focus is on direct reductions in electricity, natural gas, diesel or water expenses but such a view provides only a glimpse of the entire picture. Combining these measures and normalizing over a facilities functional square footage into an Energy Use Intensity (EUI) provides a clearer picture to managers. 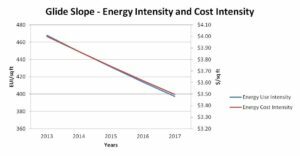 Taking the next step by adding the Energy Cost Intensity (ECI) to the analysis of performance measuring the cost per square foot brings another key metric to the manager seeking a foundation of success. Using EUI and ECI measures and setting improvement goals with these metrics creates the EGS and the baseline for key performance indicators. The graph below shows an example of EUI and ECI in combination to set goals. Using both metrics allows the managers to compare the use and cost with respect to a space which makes comparisons over different locations or other standards. Using EGS also provides you the option to track along various time scales from weekly, monthly, quarterly or annual. The only restriction is the metering capabilities and the ability for the energy data management system to collect this meter data. Using the utility service meter data, you can immediately see where you stand with respect to your goals and your peers. But that only gives you the big picture. More granular data is needed to start making decisions that will move your facility along the EGS. You need consumption data for the various areas in your hospital so you can see where energy is being used and how it impacts the entire hospital. Knowing your load profile down to a room and comparing this to your EGS is the path to success in energy effectiveness in your hospital. Knowing this information allows for deploying an improvement strategy that maximizes your capital spend and frees trapped assets dollars to use in serving patients and staff. Interestingly, most facilities already have access to this data through existing systems and can unlock the potential. Leveraging your existing utility meters, building management system and any existing sub-meters, you have the foundation for EGS success. So where are you on your Energy Glide Slope? Are the changes you’re considering reducing your use and cost intensity? Will you be making a smooth landing toward your energy goals or is there turbulence ahead? The Schneider team has helped other healthcare managers make a smooth landing and we can help you answer YES to those questions right now. Let us know in the comments!